Michigan State University in East Lansing Thursday announced it has received a $30-million gift toward the completion of the Business Pavilion at the Eli Broad College of Business. Edward J. Minskoff, alumnus and real estate developer, made the gift, which is the largest single gift received from an individual in MSU’s history. The pavilion is slated to open in fall 2019 and has a total projected cost of $62 million. The pavilion will create learning and career development spaces for business students. John Engler, interim president, plans to recommend to the board of trustees to name the facility the Edward J. Minskoff Business Pavilion. The 100,000-square-foot pavilion opens to Shaw Lane and is adjacent and connected to the current business college facilities. 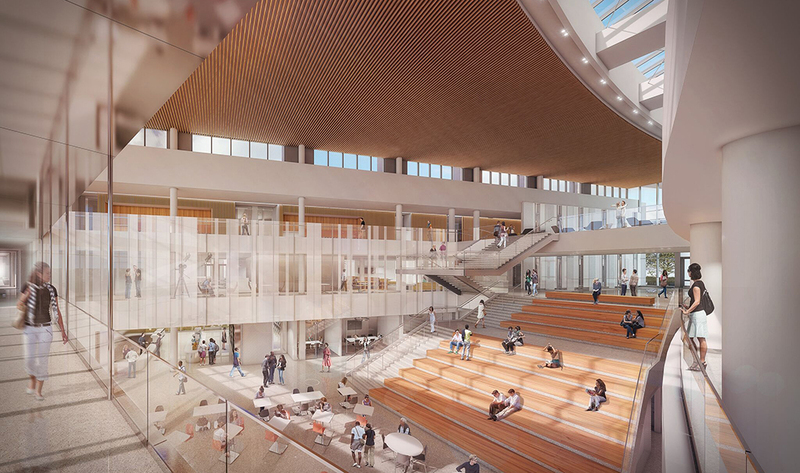 It will feature collaborative and immersive learning environments, a glass-walled atrium that offers views of the Red Cedar River, and an expanded career center. Eli Broad, for whom the project is named, kicked off the project with a $25-million challenge grant, $10 million of which was targeted for the pavilion. Minskoff’s gift ensures the project will be funded entirely through philanthropy. More than 1,400 individuals, corporations, and foundations have contributed to the project. Additional gifts will be accepted through the end of the university’s Empower Extraordinary capital campaign, which concludes Dec. 31 and has raised more than $1.7 billion to support programs and initiatives across the university. Minskoff is a member of the president’s campaign cabinet, and his financial support for MSU dates to 1964. He and his wife Julie support and named the Julie and Edward J. Minskoff Gallery in the Eli and Edythe Broad Art Museum, as well as the largest laboratory in the Biomedical Physical Sciences Building. Minskoff graduated from MSU in 1962 with a degree in economics and received an honorary doctorate in business from the Broad College in 2009. In 2013, MSU presented him with its Philanthropist of the Year Award. During his career, Minskoff has developed more than 40 million square feet of residential and office space in Manhattan and nine other major cities. He is the founder of Edward J. Minskoff Equities Inc., which owns, develops, and manages high-end office and residential properties and other real estate in urban centers.